A careful study of images taken by the NASA rover Curiosity has revealed intriguing similarities between ancient sedimentary rocks on Mars and structures shaped by microbes on Earth. 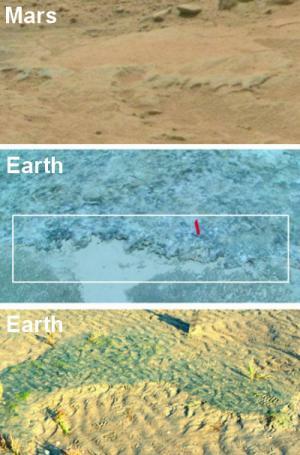 The findings suggest, but do not prove, that life may have existed earlier on the Red Planet. The photos were taken as Curiosity drove through the Gillespie Lake outcrop in Yellowknife Bay, a dry lakebed that underwent seasonal flooding billions of years ago. Mars and Earth shared a similar early history. 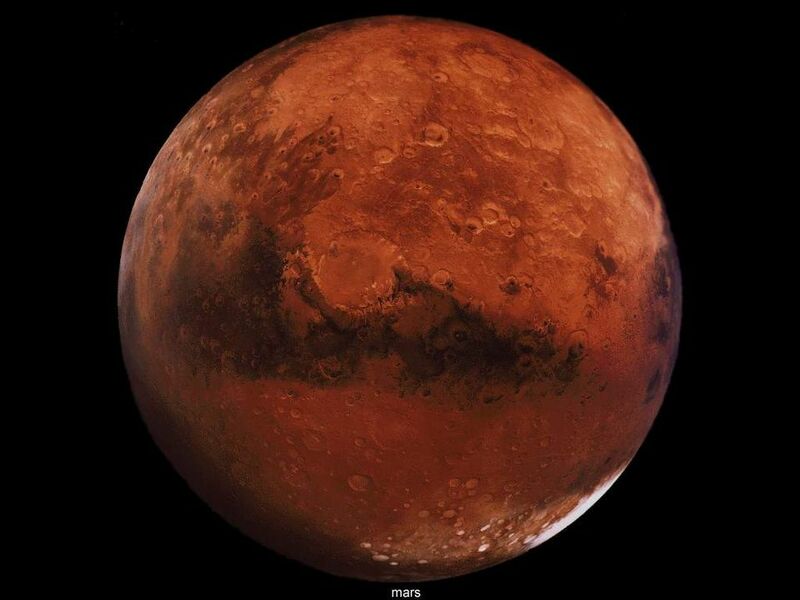 The Red Planet was a much warmer and wetter world back then. On Earth, carpet-like colonies of microbes trap and rearrange sediments in shallow bodies of water such as lakes and costal areas, forming distinctive features that fossilize over time. These structures, known as microbially-induced sedimentary structures (or MISS), are found in shallow water settings all over the world and in ancient rocks spanning Earth’s history. The distinctive shapes include erosional remnants, pockets, domes, roll-ups, pits, chips and cracks, which on Earth can extend from a few centimeters to many kilometers. Although Noffke makes a tantalizing case for possible signs of ancient life on Mars, her report is not a definitive proof that these structures were shaped by biology. Getting such confirmation would involve returning rock samples to Earth and conducting additional microscopic analyses, a mission that isn’t scheduled anytime in the near future. Overlay of sketch on photograph from above to assist in the identification of the structures on the rock bed surface. Image credit: Noffke (2105). Credit: ASTROBIOLOGY, published by Mary Ann Liebert, Inc. The images on which Noffke drew are publicly available on the Mars Science Laboratory page on NASA’s website. 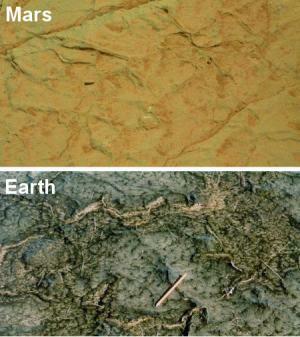 Noffke compared the rover pictures to images taken at several sites on Earth, including modern sediment surfaces in Mellum Island, Germany; Portsmouth Island, USA; and Carbla Point, Western Australia; as well as older fossils of microbial mats in Bahar Alouane, Tunisia; the Pongola Supergroup in Africa; and the Dresser Formation in Western Australia. 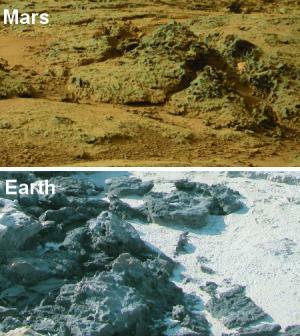 The photos showed striking morphological similarities between the terrestrial and Martian sedimentary structures. The distribution patterns of the microbial structures on Earth vary depending on where they are found. Different types of structures are found together in different types of environments. For instance, microbial mats that grow in rivers will create a different set of associations than those that grow in seasonally flooded environments. The patterns found in the Gillespie Lake outcrop are consistent with the microbial structures found in similar environments on Earth. What’s more, the terrestrial structures change in a specific way over time. As the microbial mats form, grow, dry up, crack and re-grow, specific structures become associated with them. Here again, Noffke found that the distribution pattern in Martian rocks correspond with microbial structures on Earth that have changed over time. Taken together, these clues strengthen her argument beyond simply pointing out the similarities in shape. In her paper, she also describes alternative processes through which these could have formed. For instance, the chips, pits and cracks could be the product of erosion by salt, water, or wind. At the end of her report, Noffke outlines a detailed strategy for confirming the potential biological nature of the Martian structures. Unfortunately, one important step—returning samples to Earth for further analyses—is just not feasible yet. Noffke also lists a series of measurements Curiosity could potentially do to strengthen the case if it came across such structures again, including looking for organic or chemical signatures using its Sample Analysis at Mars (SAM) instrument. On Earth, scientists typically confirm the biological nature of microbial sediment structures by searching for specific microscopic textures, which involves cutting rocks into thin slices and studying them under a microscope.